Upon arriving here last night within the city limits of Ripon, we the Mules were informed by the Ripon City Police that the Ripon City Council had recently passed a no camping law forbidding anybody traveling by foot, bicycle or horseback from stopping anywhere within city limits of Ripon on public space to sleep for the night. The above being understood, we the Mules have taken it upon ourselves to deliver this day 4/24/2017 Mule Proclamation number 2645-A to the Ripon City Council. Anybody traveling by foot, bicycle, horseback, crutches or wheelchair using their own physical resources to do said within the constitutional boundaries of the United States is doing so under the constitutional guarantees to move freely in anyone of all four directions, how you choose, when you choose. Stopping to sleep for the night is a necessary component for our right to move freely. For if the necessary function of sleep is denied, all other human activity and living experience is also being denied. To put it short and sweet without sleep, you die. The Mules have come to the inevitable conclusion we cannot obey this law for to do so will be our death. For any municipality and its city officials within the constitutional boundaries of the United States to spring forward and declare this most necessary function to life itself sleeping to be illegal and subject to heavy fines and jail time is a slap in the face in blatant disregard to all those who have given life and limb throughout this country’s history to protect and preserve humanity’s God given right to move freely. The Mules will not give up this right. We’ve been here for hundreds of thousands of years. We haven’t given it up then nor will we now. 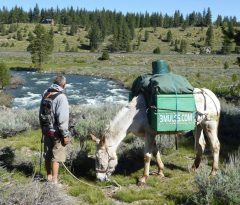 The Mules invite the mayors and city council members of the many towns which the Mules will be traveling through to send their explanations and justifications as to why they have passed the no camping law in their town. The Three Mule Nation will be interested to hear the rational for enactment of such laws to be used against people traveling via non-motorized vehicles by foot, bicycle, horse. The Mules will gladly post their response in its entirety on our website 3Mules.com, Facebook, Instagram and Twitter pages.